The ruins of a 17th century mosque has been discovered after the collapse of a retaining wall in Turkey's southeastern Mardin province. 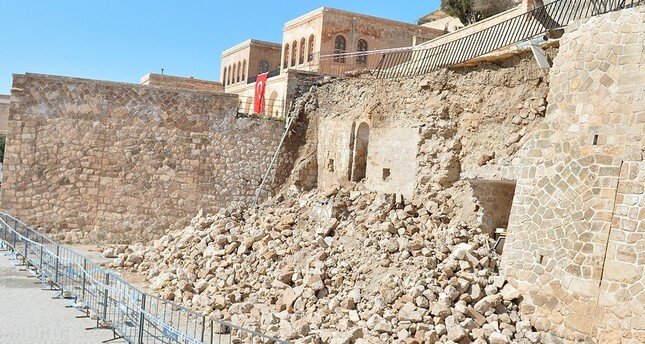 Delighted to announce the discovery, Emin Selçuk Taşer, who is a research assistant at Mardin Artuklu University's Faculty of Architecture, told reporters that they believe the ruins belong to the Muhammed El-Gazi (Ghazi Muhammad) Mosque. The retaining wall reportedly collapsed following heavy rains in Artuklu district. Taşer noted that they had seen a domed structure in old pictures of the area and were looking for traces of the building in the area. During the Ottoman Empire, the area was used as a square with a townhouse, municipal building and barracks. "We couldn't believe it, we were so happy to see the mosque," Taşer said, adding that they think the mosque is believed to be destroyed at least 100 years ago. The Committee Director of UNESCO Turkey's National Commission Professor Murat Çağlayan noted that a book written by Abdülgani Efendi in 1930 refers to the mosque as Muhammed El-Gazi mosque and mentions that it also had a tomb. Çağlayan said that they think the mosque was built in the 17th or 18th centuries based on the size of the stones used to build it. Officials hope they will be able to unearth more remnants of the mosque after they are able to bring together the stones that were under the collapsed retaining wall. Ghazi Muhammad, also referred to as Qazi Mullah, was the first imam of the Caucasian Imamate in Dagestan, who fought against Russian forces during the Murid War.